People ask me all the time for simple recipes that are healthy and flavorful and can be made quickly on a weeknight. This is one of those recipes that both kids and adults can enjoy together. This easy recipe can be made in 25 minutes flat and the seasoned potatoes themselves require few ingredients. The dipping sauce is great and it’s optional. If you choose to make it, you can complete the sauce while the potatoes are in the oven. Dipping sauces that are also great with these baked potatoes are prepared pesto, or ¼ cup of Greek yogurt with a squeeze of lemon, garlic salt and cracked pepper. For this recipe, I used creamer potatoes that are smaller than Yukon gold potatoes but larger than fingerlings. Any small potato will do and for kids, the colored variety packs of small potatoes would definitely entice them to have more. The smokey flavor of my Healthy On You “You’re So Spain” spice blend really adds a big yum factor that you don’t want to miss! Pre-heat the oven to 400°F. Prepare a 9x13 baking sheet lined with parchment paper. Set aside. 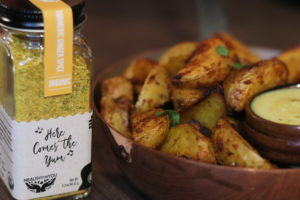 In a large bowl, toss the potato wedges with the olive oil, You're So Spain spice blend, coconut palm sugar, and the kosher salt. 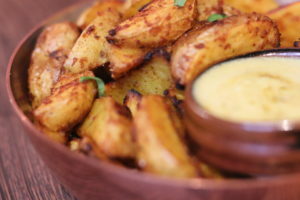 When the oven is up to temperature, add the potato wedges to the baking sheet in one even layer with no overlapping. Place in the oven and bake for 15 minutes. In a small saucepan, heat the coconut milk to a gentle boil under medium heat. when the coconut milk begins to boil, add the cur paste and stir until it is incorporated. Add the stock, coconut palm sugar and continue to cook for 5 minutes or until the sauce reduces by half. Remove from the heat, add lemon juice and allow to cook for 8-10 minutes. 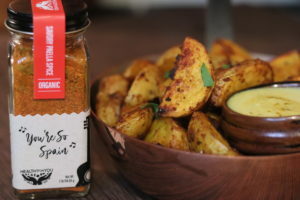 Stir in the Greek yogurt and serve alongside the potato wedges.